We have changed the dates for the French Alps packrafting meetup it is now confirmed : 8th to 14th of July. If you can update your original post, it would be awesome ! I will be packrafting around the French Alps over July and August. If anybody is willing to join, for a day or a week. Hit me up. Well filmed and cool narration. I'll be paddling this region this summer so it's also very informative for me ! Topic: European Packrafting meet-up 2018 registration open ! European Packrafting meet-up 2018 registration open ! Topic: [UPDATED January 20th ]European packrafting meet-up !!!! Re: European packrafting meet-up !!!! I'll be happy to share my story. Should we post it here ? Topic: [UPDATED] European packrafting meet-up 2018 - official date ! Re: [UPDATED] European packrafting meet-up 2018 - official date ! All the latest info have been updated ! stay tuned for the official page within a couple week ! [UPDATED] European packrafting meet-up 2018 - official date ! Packrafting the John Muir trail ? I am willing to do the John Muir trail which passes through Yosemite, Kings Canyon and Sequoia National Parks and I was wondering if you think there is a descent amount of packrafting possible. Topic: Wanna paddle in Europe ? Re: Wanna paddle in Europe ? [UPDATED January 20th ]European packrafting meet-up !!!! 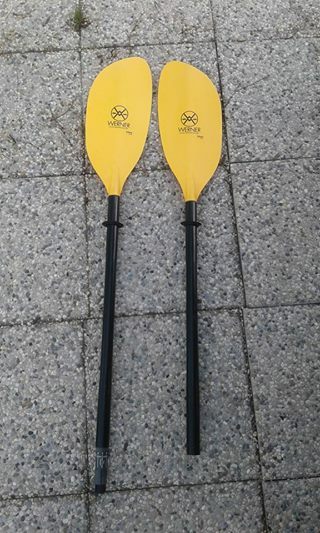 I am selling my paddle Werner Tybee FG used barely 10times. It is a high angle two piece paddle with adjustable angle. You know the deal with Werner, once mounted it does feel like a one piece paddle. I can ship anywhere at extra cost. Wanna paddle in Europe ? I'm looking for paddling partners around Europe. Anybody keen for some paddling ? Anytime of the year, hit me up ! I am based in Slovenia (Soca river, ho yeah !!! ), so Austria, Italy is best for me, but I can fly easy for a multi-day trip ! What about Koaro Packraft ? They are made in N.Z, so you would not have to pay for customs, and I think the customer service would be much better. 1300NZD for the white water version. I sent you an E-mail, hope you got it ! Are you coming to NZ to packraft but do not have an idea where ? Well, Dan has started a website with all the "known" trips at the moment. All the infos are based from other users, feel free to submit your trips. Hope it will help other people ! Try your luck on facebook : "packrafting in new zealand"
people should be able to help you ! Topic: Looking for coconspirators in March! Re: Looking for coconspirators in March! Use facebook mate. there is a group called : "Packrafting in NZ"
you will find people to paddle with I am sure !